On the 12th of October 1917, 846 young New Zealanders were killed in the Battle of Passchendaele in Belgium, with many more to die over the coming days from the wounds received on this one day. By the end of the day the total number of casualties, the wounded, the dead and the missing was 2,740. It took two and a half days to clear the battlefield of the dead and injured. On the 4th October 2007 (the 90th anniversary of the Battle of Broadseinde) the Rt.Hon Helen Clark ONZ representing the Government of New Zealand was in Ypres where together with the Flemish Government they signed the Ypres Agreement. The agreement committed New Zealand to co-operate in “… increasing broad community recognition … educating younger generations … honouring the war dead … preserving heritage material … and encouraging tourism to commemorative and historical sites in Flanders and New Zealand…” This agreement inspired the 2009 exhibition “Passchendaele: The Belgians Have Not Forgotten”. and the erection of 5,000 white crosses on the parade ground of Fort Takapuna. The Passchendaele Society (Inc) was formed in March 2011 by a dedicated group of enthusiasts who want to ensure New Zealand’s darkest day is not forgotten. 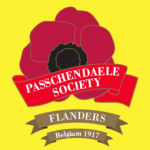 More information on the Passchendaele Society may be found via the “About Us” button at the top of this page and our Newsletter is available under the “E-news” button. This website seeks to provide Society members, students and casual visitors alike with a channel to e-sources and resources on the First World War. Please explore our website for links to World War I websites, information on the Passchendaele Offensive, it’s context in the First World War, and the annual Veteran Affairs multi-media competition “Why do we remember Passchendaele? Click on Membership for options to join the Society. This remains a small fee of only $20 per year. The Royal New Zealand Returned Services Association (RNZRSA), The Auckland RSA, The Devonport RSA, The Auckland Officers’ Club, and The Rotary Club of Newmarket and Student Horizons who is assisting us in our quest of educating the Younger Generations by sending them to Belgium to see and learn everything first hand. • facilitate access and promote visits to historic and commemorative sites. • support conservation and interpretation of heritage material from Passchendaele and the Western Front. • maintaining contact with the Ministry of Arts, Culture and Heritage and other organisations who share our objectives. • Raising the levels of awareness in the community . • Greater knowledge of Passchendaele and the Western Front in young people. • Commemorating the war dead through commemoration services. • Encouraging the community to visit Passchendaele and the Western Front. • setting up Fields of Remembrance Trust which established Fields of Remembrance in almost all New Zealand schools . • with Ministry of Education established a competition “Their Stories-Our Stories”. Presentation at Parliament by Minister of Education. • planning competition through Ministry of Education “Why I Want To Be In Passchendaele in October 2017.” Winners 10 students to Passchendaele. • publicising details of 1914-1918 commemoration ceremonies in Passchendaele and the Western Front. • planning a New Zealand Garden and Memorial in Passchendaele Area to be opened at the Centennial Commemoration of the Battle of Passchendaele. • Supported exhibitions of heritage material supplied by Passchendaele Memorial Museum 1917 and the New Zealand Defence Force. • established regular and continuous contacts with the Ministry of Culture and Heritage, the WW100 and other related organisations.